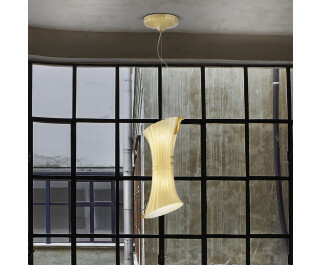 The Laguna pendant light by Vistosi has been designed by Chiaramonte & Marin 2002. This blown glass design is made in "rigadin" style with 24k gold specks and "seta" decoration. The diffuser is detailed in amber glass with gold plated over metal decoration. This beautiful light was hand crafted on the island of Murano.